Having a child is a life changing moment for parents, it is important that your newborn is given a safe experience, when choosing baby and nursery products this becomes an absolute priority. 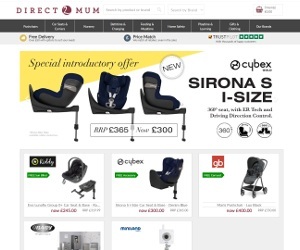 Direct2Mum stocks the latest and best brands from the nursery sector, you can find pushchairs, car seats, bath time accessories and much more. Direct2Mum knows having well known and safe baby brands is key. That is why they stock the likes of iCandy, Silver Cross, Maxi-Cosi, Quinny and many, many more. They even have a full brand list breakdown so you can see for yourself. Direct2Mum also offer an attractive free delivery on orders over £50, which is great for those looking to do their baby shopping from the comfort of their own home.